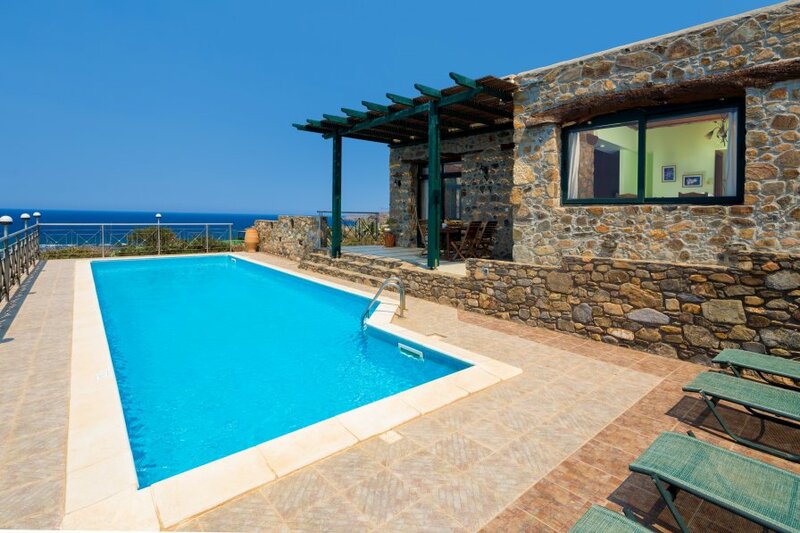 Villa Elafonissi is a 2 bedroom villa situated on the edge of a hill just 200 m from the sea. The gate entrance walks into the terrace where the outdoor dining area is shaded under a pergola & private pool (11 x 4, 5 m) is lying in front. The interior is split up into two levels. The higher level hosts the twin bedroom, one bathroom with Jacuzzi, the fully equipped kitchen and the dining area. The lower level is consisted of the master bedroom & the living room. The bedroom with en-suite bathroom has direct access to the balcony leading to the garden. A beautiful view of the sea is offered when lying on the bed. The living room in earthy colors creates a cozy atmosphere. Special features of this villa the wide openings especially the big window at the dining area which offers spectacular views of the sea.